Feb. 8 (UPI) — Scientists have long suspected that the Milky Way and Andromeda galaxies are on a collision course, but now, thanks to new data from the European Space Agency’s Gaia satellite, researchers finally know how fast and at what angles the two galactic bodies are approaching impact. The Milky Way and Andromeda, along with the smaller Triangulum, are the three biggest galaxies in the Local Group, a collection of more than 54 galaxies — most of them dwarf galaxies. While scientists think all 54 members are organized by their gravitational influence on one another, the positioning and trajectories of Local Group members isn’t well understood. Launched in 2013, Gaia is working its way toward compiling the “book of the heavens” — the largest and most precise 3D space catalog in history. At the culmination of Gaia’s science mission, the space observatory will have surveyed a record 1 percent of the universe’s 100 billion stars. Through two data releases, the second of which occurred in April, Gaia has detailed the precise positions and movements of millions of stars. For the latest research, scientists used data from Gaia’s second release to better understand the dynamics of the Milky Way’s galactic neighbors. Andromeda and Triangulum are located 2.5 and 3 million light-years from the Milky Way, but the duo are close enough to each that they are likely influencing one another’s trajectories. Astronomers used the latest Gaia data to more accurately characterize the relationship between the two galaxies. After combining the newest Gaia measurements with existing observations, researchers were able to model past and future orbital paths for each galaxy. Previously, scientists surmised Triangulum is on one of two paths. A long orbital journey featuring several run-ins with Andromeda or a shorter track with no previous collisions. 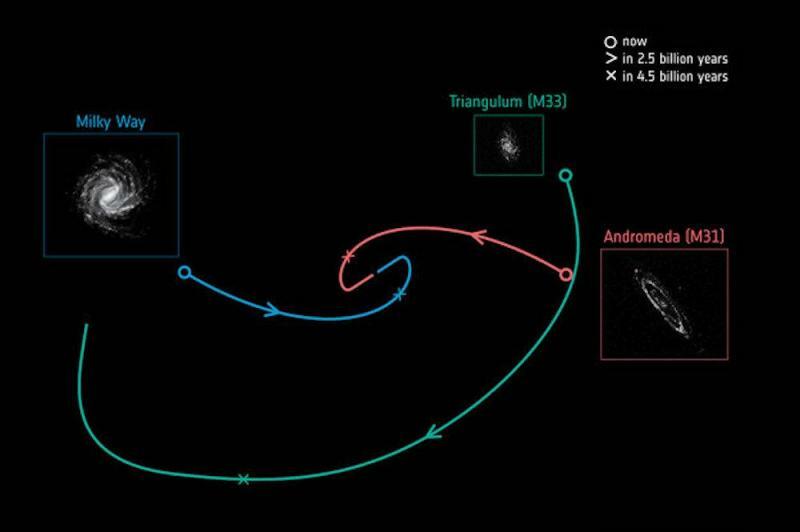 The latest models — described by Fardal, Van der Marel and their colleagues in the Astrophysical Journal — suggest Triangulum is on a shorter path and is in the midst of its first infall into Andromeda. The new model showed Triangulum’s influence on Andromeda will cause the larger galaxy to make a more glancing blow when it collides with the Milky Way. Updated simulations also determined the Milky Way-Andromeda collision will occur in 4.5 billion years, not 3.9 billion years as previously predicted.